Home > meteor > What Was The Massive Fiery Light Over Russia? Valgus Üle Taeva Venemaal ? What Was The Massive Fiery Light Over Russia? Valgus Üle Taeva Venemaal ? 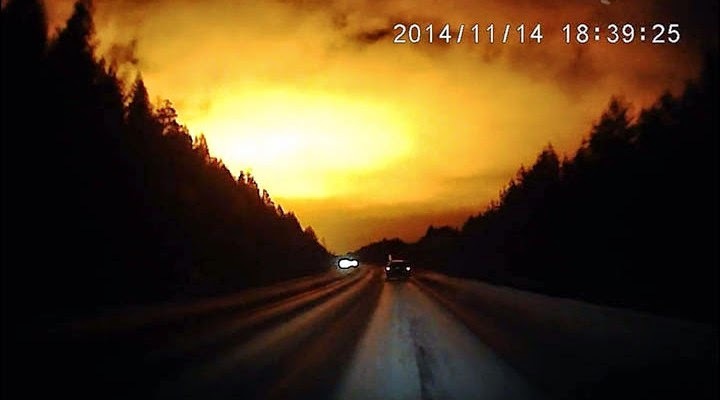 Onlookers in the Sverdlovsk region of Russia witnessed an extraordinary huge orange flash appear in the sky on November 14th, 2014 around 6:39 pm local time. The huge light is raising many questions amongst both witnesses and across the various social media platforms, particularly after the authorities refused to give an explanation. Was it something related to meteors? Or perhaps an asteroid? Reports claimed that both scientists and emergency services are struggling to explain the unusual fiery phenomenon. Various amateur videos and photos were posted on social media as locals captured the massive ‘blast’ on their phones. Local news sources claimed that the potential reasoning behind this event is military based -with them performing a routine disposal of explosives. More theories talked about a missile or an object from space. But no theory has been confirmed to this point. A previous similar explosion took place in Chelyabinsk in February of 2013; it was a meteorite which exploded over the Urals. But according to witnesses, it did not have the same shape as the new one. Astronomer Vadim Krushinsky remarked that the color of the blast discards the meteor theory. He explained to Ekburg.tv that the shade of light depends on the body’s temperature, and flashes caused by bolides are usually whiter. According to RT, he suggested that his own theory surrounding the launch of a space rocket might have been the cause. Another video of the mysterious flash was posted online, providing a new vantage point. This video shows a bright light on the ground. The Russian Federal Space Agency’s website claimed that the latest launch from the Plesetsk cosmodrome took place on October 29th; with the next one scheduled for November 24th.